I do not want software upgrade. Free Shipping within USA, our lowest price guarantee & Software Upgrade Service option available. we are not drop-shipper. We actually have this product in stock. This will allow us to provide you with service which others can not. FYI Xlink comes with mfg. preloaded software which will works fine for 95% of our customers. For owners of iPhone4 (firmware upgrade only), Samsung, LG or Sony Ericsson cell phones we do recommend upgrade and patch installation. If you have a good computer skill, standard USB printer cable and a computer with OS (XP, Vista or Windows 7) you can also Do It Yourself for FREE after you receive your product. If you decide to buy one of the firmware upgrades, let us know your cell phone make and model at the checkout comment line. We will match or beat any legitimate price (including S/H) posted online within 30 days from date of the purchase. Item must be a brand new item (not refurbished or used). Land line is optional and not required. If you drop your land line service Xlink BTTN will continue work with your cell phone(s). Easy Line Reversal switch for call termination included in the software. Keep the cell phone and land line service. Built in Bluetooth Module Class 2 for wireless, automatic connection via proximity up to 3 Bluetooth enabled cell phone. Our 30 days Money Back Guarantee and full 1 year Manufacturer's Warranty provided to you along with dealer's receipt. Cell phone network providers do not support fax, modem, Sattelite TV, Tivo, Credit Card Processor. These services will function only with active Land Line Phone. Compatible with 1000+ Bluetooth enabled cell phones. XLINK products work on all cellular networks world wide. XLINK BTTN the next generation of Bluetooth® based product. Turn your home corded and cordless phones into a cellular multi-line phone system. The XLINK family of products make it possible to send and receive cell and land line phones calls using regular telephones. No more searching for your cell phones just use regular phones at home or in the office. The XLINK can simultaneously connect to three different cell phones one for each family member! As many standard telephones as desired can be plugged into the back of the XLINK. Whenever any of the connected cell phones ring, all the standard telephones ring also! The XLINK BTTN Cellular Gateway connects three cell phones to regular telephones. After setting up the XLINK you can use regular phones to make and receive calls over any of the three connected cell phones. 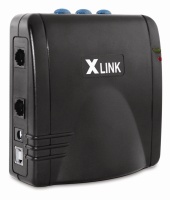 The XLINK BTTN can be used at home or the cottage, on the your boat or RV, or anywhere you use your cell phones. 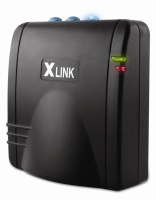 Using Bluetooth® wireless technology, the XLINK BTTN communicates wirelessly with your cell phones. There are NO extra cables to buy. Whenever your cell phones are placed within range, the XLINK BTTN will automatically connect to them. We abandoned our landline about a 18 months ago and installed an Xlink BTTN. Installation was simple and quick. Only criteria is that you have a good signal on the cell phone in that area and it needs to be a handy place to lay the cell phone and pick it back up again as you leave the house etc. When we're home we lay the cell phone on the counter near the Xlink and every phone in the house works. Love it.